The Wildcats held the Bobcats to 0 in sweltering heat. Given the sweltering heat and strong footwork of the Bobcats, the pacing of the competition started off well matched. However, defenders Kate Macket and Shannon Moran punted defensive shots by the Bobcats into safer territory. In the backfield, Nikki Petrescu-Boboc also cleared many threatening advances aside. Many of the Bobcats' shots came in the games' first few minutes, but Goalie Jenna Santos contributed strongly, with 10 saves by the end of game. Six minutes into the first half, Co-captain Maddy Haynes, changed the tide and set the tone for the Wildcats' lead for the remainder of the event. Five minutes into the second half, freshman Lily Wennik added a second goal, sprinting to the net with defenders surrounding her, drawing the Bobcat goalie out, only to tap the ball into the bottom left of the net. This breakaway sneak attack shot was followed by another from Haynes after one of her many successful sprints against rival Bobcats to the net. 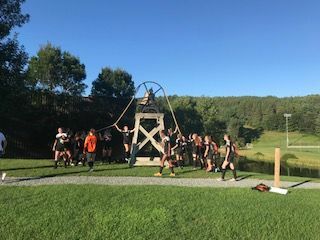 Freshman Ellie Stedina and Juniors Catie Flynn and co-captain Molly Beaupre helped to moved the ball into open positions with well-placed positioning and confident footwork. Strong passing in the front field led to a fourth goal by veteran midfielder Sofia Garner, assisted by an artfully-placed lofty pass at the toe of striker Caroline Sheehan. The Wildcats JV Soccer team made this second victory look easy with their teamwork and hustle. Six minutes into the first half, Co-captain Maddy Haynes, changed the tide and set the tone for the Wildcats' lead for the remainder of the event. Five minutes into the second half, freshman Lily Wennik added a second goal, followed by another from Haynes after a sprint against rival Bobcats to the net. Freshman Ellie Stedina and Juniors Catie Flynn and co-captain Molly Beaupre helped to moved the ball into open positions with well-placed positioning and confident footwork. Strong passing in the front field led to a fourth goal by veteran midfielder Sofia Garner, assisted by an artfully-placed lofty pass at the toe of striker Caroline Sheehan. The Wildcats JV Soccer team made this second victory look easy with their teamwork and hustle.